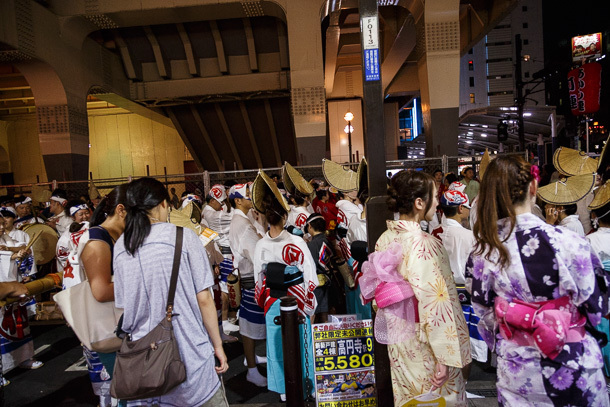 When I wrote up the earlier entry about my initial walk around Kōenji (高円寺), I got the feeling that I had done the neighborhood a disservice, with my late morning visit managing to capture it at its least flattering time during the day. 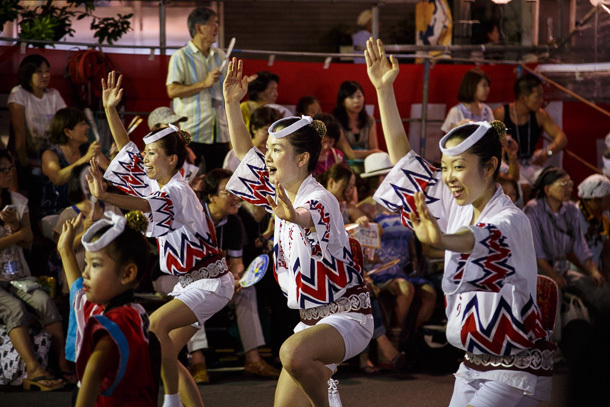 I described the evening atmosphere based on others’ accounts and noted my intention to return in the future, not expecting that chance would put me back in Tokyo during Awa Odori, when the entire area around Kōenji Station becomes a massive street party. 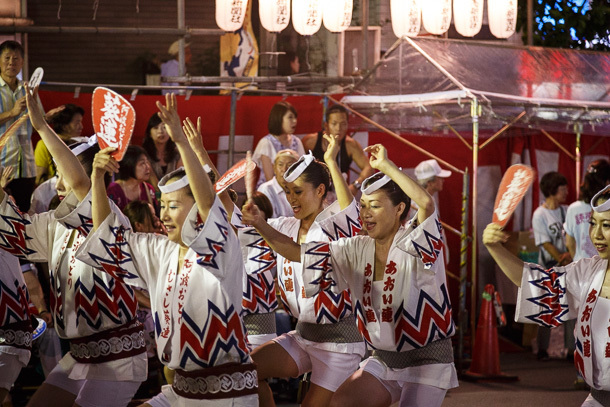 Awa Odori was born out of the particularly raucous variation of Bon Odori practiced in Tokushima Prefecture, which had become well-known as early as the 16th century. 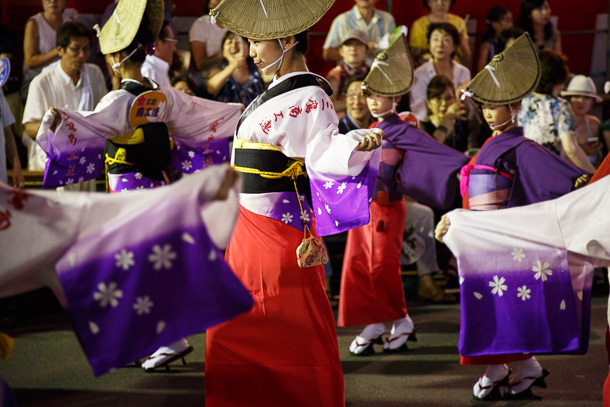 Tokyo Kōenji Awa Odori (東京高円寺阿波おどり) was established in 1956 by migrants from Tokushima, and is second in size only to the original festival in Tokushima City, which is the largest dance festival in Japan. 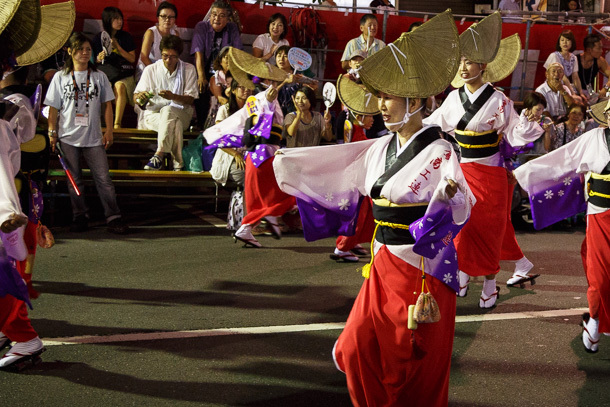 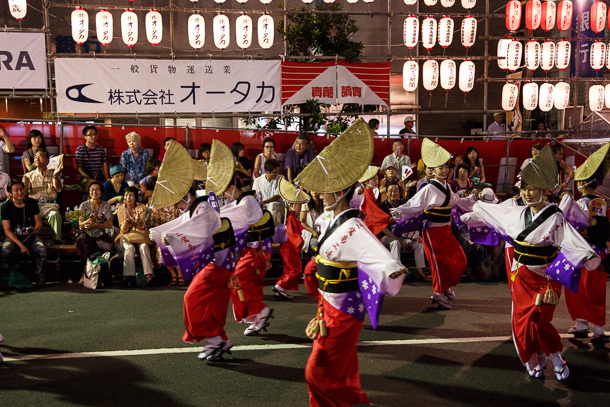 In recent years, for two nights at the end of August, between 10,000 and 12,000 dancers and 1 to 1.2 million visitors flood the streets in what is a highlight event not just for Kōenji, but all of Tokyo. 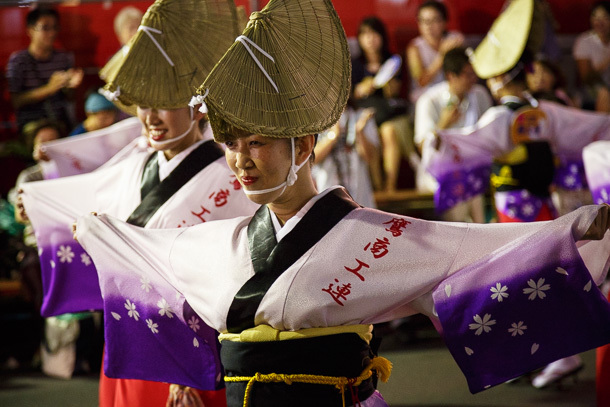 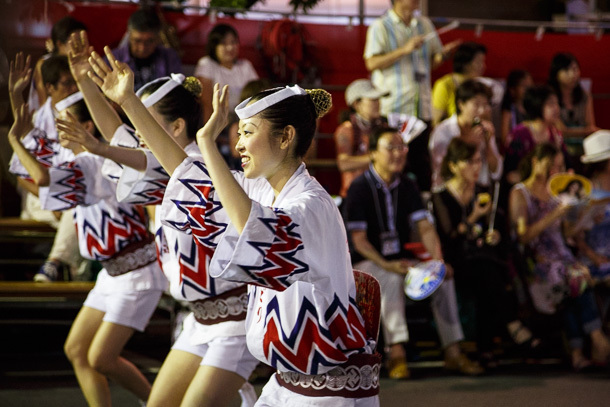 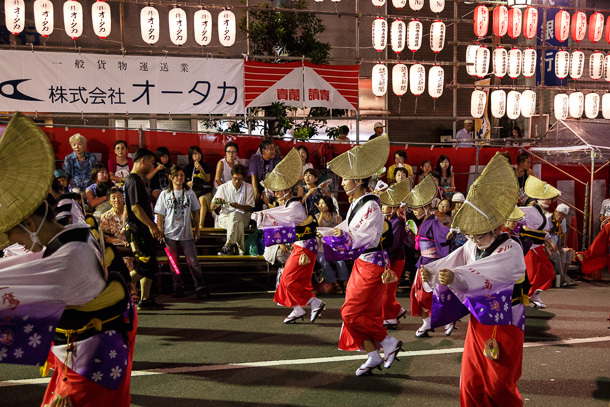 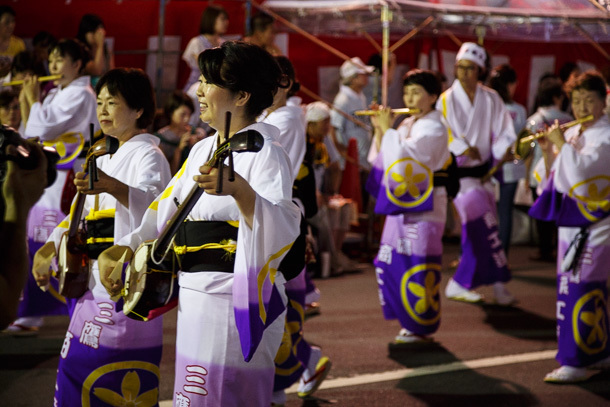 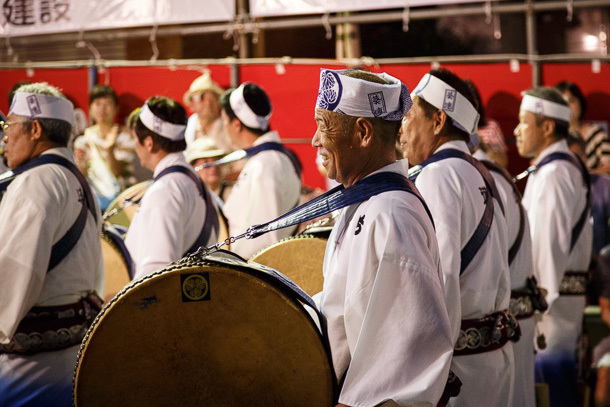 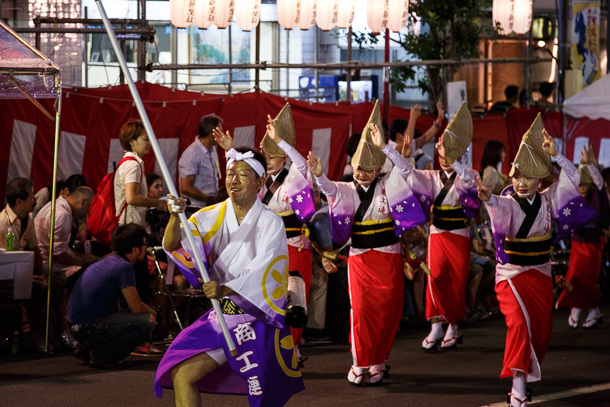 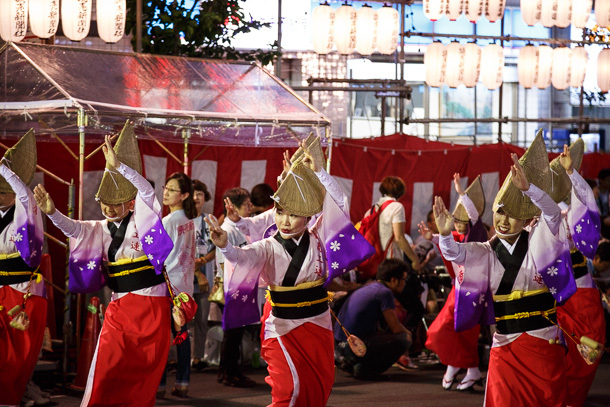 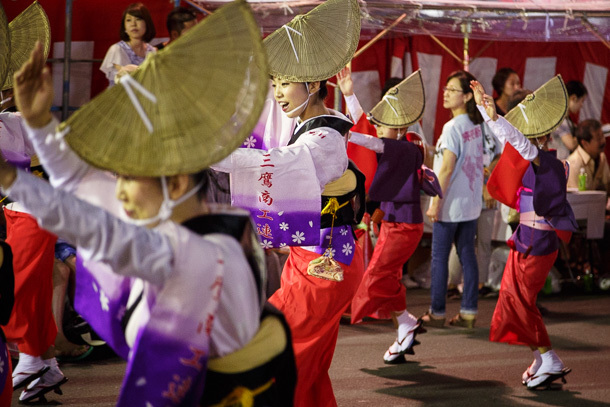 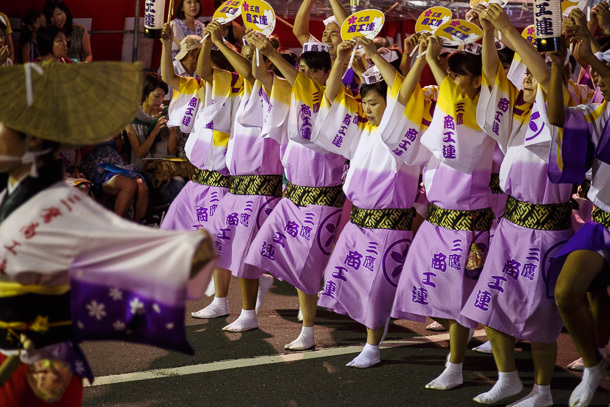 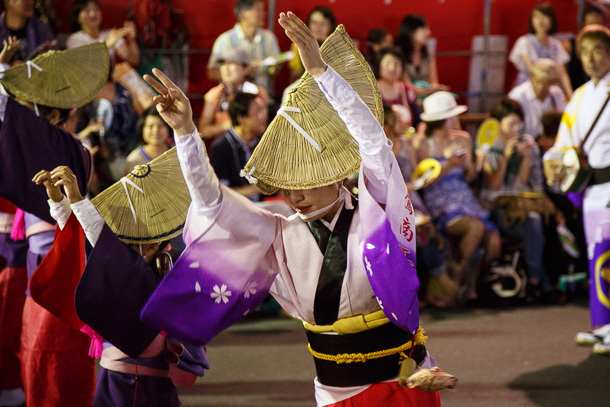 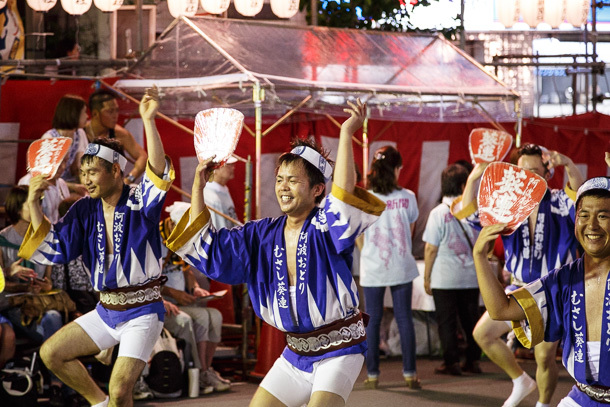 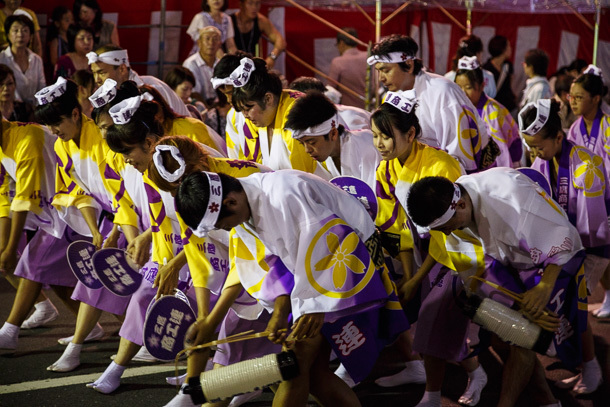 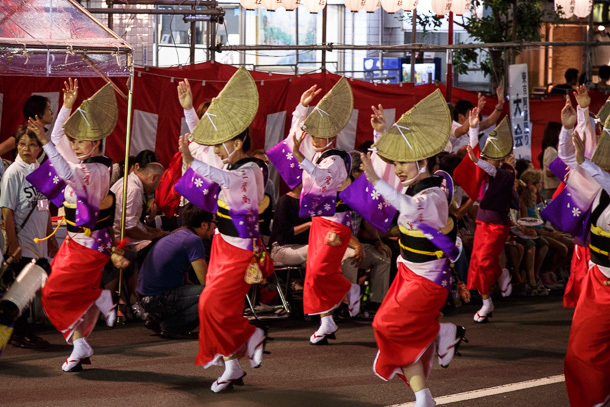 The event is managed by the Tokyo Kōenji Awa Odori Shinkō Kyōkai (東京高円寺阿波おどり振興協会), a nonprofit corporation created by the town council and local shōtengai. 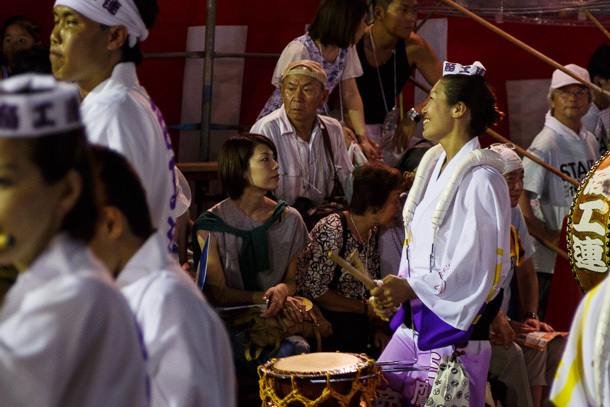 Dedicated visitors come early in the day to secure a spot in the main performance areas near Kōenji Station, where the groups typically stop and perform a complete cycle of their routine. 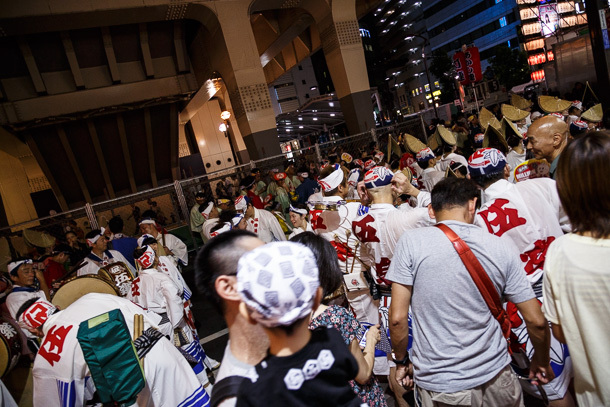 By the time we arrived, a little after the 5:00pm start time on the second day, the crowd was so dense that police were directing everyone to walk south for about 250 meters before we could work our way back up toward the center. 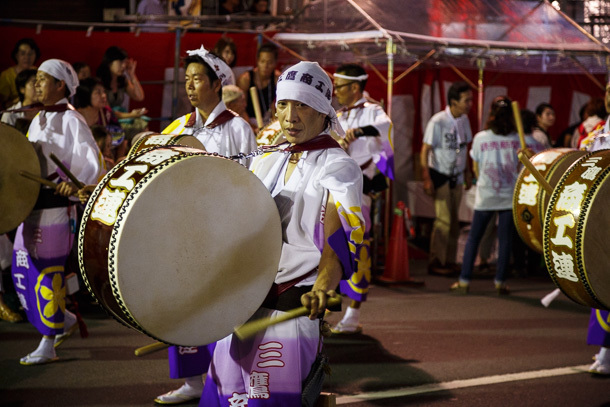 Despite the half million or more people in attendance each night, high spirits and smiles remained in abundance even in the most crowded areas, helped no doubt by the stream of chanting and thumping from the ren making their way through the streets. 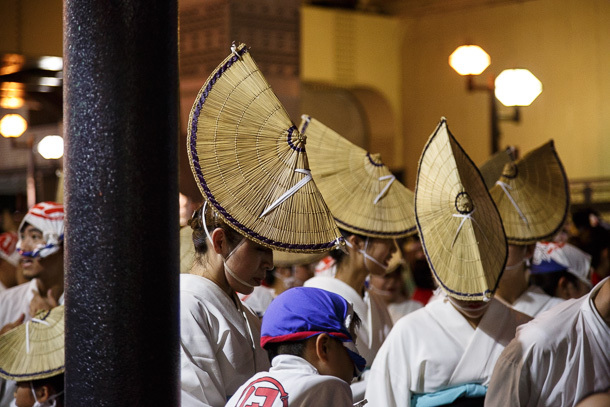 Amigasa, braided straw hats, come in many variations, but this particular style is distinctive to the female costumes in Awa Odori.